When people are looking for good farmland, what they are searching for is a property that is ideal for farming crops or raising animals. There are many factors making land optimum for the purpose of growing plants, including soil quality, climate and location. Even those who are raising only animals need farmland that is able to grow quality pasture for the animals to eat. One of the most important aspects of a successful farm is the quality of the soil. Good soil is full of organic material and has the ability to effectively transport water and nutrients to plants. It does this by having a high quantity of rich biological components, and by having a balance of sand, clay, dirt and rock that provides a stable, well-drained environment for plants. A very swampy property is unusable for almost anything. Plants need to have well-drained soil that will maintain some moisture, but will also allow water to drain away. Any animals raised there also need to have a dry, comfortable environment. While this has to do with the soil, it also has to do with the topography of the land and what is underneath the soil layer. Land that is too low in a valley or concave so that it collects rainwater without being able to drain quickly is not an ideal place for plants or animals. On the same note, soil with subsurface water that is invading the root space of plants will simply stunt the growth of the plants, rather than benefiting them. The USDA and other organizations produce maps that help farmers decide if certain plant varieties are viable in your climate. These maps usually divide areas into zones that are ten degrees colder (or warmer) than each other. While you might think that the best farmland would always be in warm areas, it is really what location is best for the plant to be grown. Some plants prefer cooler temperatures. 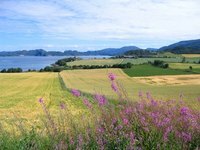 Today, good farmland is usually located in an area that has other farms in it already. The reason for this is that a farm shouldn’t be near anything that could potentially harm the quality of the crops grown or the animals raised there. Even non-organic farms would not want to be downstream from a factory, which could potentially poison the groundwater and ultimately anything growing there. At the same time, it is beneficial to farm near an urban center or some method of distribution. Good farmland has to make economic sense. With farmland comes a history, not only of the people who farmed it before, but also of water and temperature patterns. Ideally, good farmland has year-round access to water, either through a well, spring or stream. Many farms dry up during the summer, right when it is most needed. At the same time, knowing where the sun shines and the past temperatures can tell you a lot about what can grow. If people have lived there before, it is also a good idea to try to find out what they did–for example, what they grew and whether they used any chemicals. University of Minnesota Extension: Soil Water Concepts, Sands, G.
What Is the Meaning of Subsistence Farming? What Planting Zone Is Kentucky?